This form is a subordination, attornment and non-disturbance agreement (commonly referred to as SNDA) drafted for the Bank of America, where the bank is the lender that made the real estate loan for the property. The document subordinates the tenant’s lease to the financing encumbering the property, and provides the tenant with possessory rights if the landlord defaults under the financing. In such a case, the tenant will not be disturbed if it continues to pay rent and otherwise perform under the lease. 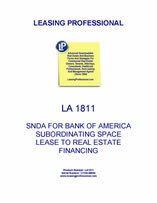 This SNDA also contains a provision requiring the tenant to furnish an estoppel certificate containing specified information about the tenant's lease. Real Estate Banking Group No. NOTICE: THIS SUBORDINATION, NONDISTURBANCE AND ATTORNMENT AGREEMENT RESULTS IN YOUR LEASEHOLD ESTATE BECOMING SUBJECT TO AND OF LOWER PRIORITY THAN THE LIEN OF SOME OTHER OR LATER SECURITY INSTRUMENT. This Subordination, Nondisturbance and Attornment Agreement (this "Agreement") dated ___________ , ______ is made among _________________ ("Tenant"), __________________ ("Landlord"), and Bank of America, N.A., a national banking association ("Lender"). WHEREAS, the term "Landlord" as used herein means the present landlord under the Lease or, if the landlord’s interest is transferred in any manner, the successor(s) or assign(s) occupying the position of landlord under the Lease at the time in question. 1. Subordination. Tenant agrees and covenants that the Lease and the rights of Tenant thereunder, all of Tenant’s right, title and interest in and to the property covered by the Lease, and any lease thereafter executed by Tenant covering any part of the Property, are and shall be subject, subordinate and inferior to (a) the Deed of Trust and the rights of Lender thereunder, and all right, title and interest of Lender in the Property, and (b) all other security documents now or hereafter securing payment of any indebtedness of Landlord (or any prior landlord) to Lender which cover or affect the Property (the "Security Documents"). This Agreement is not intended and shall not be construed to subordinate the Lease to any mortgage, deed of trust or other security document other than those referred to in the preceding sentence, securing the indebtedness to Lender. (b) Lender will not join Tenant as a party defendant for the purpose of terminating Tenant’s interest and estate under the Lease in any proceeding for foreclosure of the Deed of Trust.